The Kingdom of Poland is still a relative infant, but an infant that already appears to boast a considerable grip on the lands around the capital of Krakow. The Polish people can attribute their rapid rise out of obscurity to the Drang nach Osten (Drive towards the East) of the Holy Roman Empire, which saw the Kaiser searching for allies to help crush the Polabian Slavs. After converting to Christianity, Boleslaw the Brave saw it as his right and duty to conquer neighbouring lands, including thrusts as far east as Kiev, and even forays into Imperial lands during disputes between the Kaiser and the Pope.That last act of betrayal is a sign of recent times in Poland, with internal power struggles stalling the continued expansion of Polish borders. Fortunately for the Poles, the last King to rule with any true sense of stability, Kazimierz I, paved the way for granting fiefdoms to his warriors, establishing a tradition of feudalistic knighthood required to be a power in Europe today.Only now is order truly being restored with Wladyslaw Herman taking the throne with his brother being forced into exile. 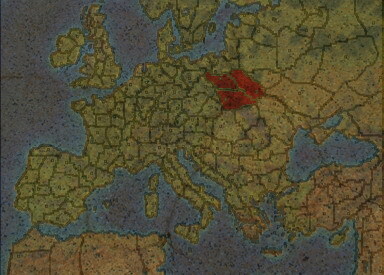 Siding with the Pope in his recent clashes with the Kaiser has helped establish Poland as a legitimate Catholic power, ensuring the Reich can no longer expand eastward with the blessing of Christendom.However, the lack of an immediate Imperial threat does not ensure that the Poles have an easy option to expand either. The Hungarian King L?漳zl蝐 is simply too formidable and familiar with Polish ways to make moving southward a viable option, making securing the lands of the Baltic Sea the most appealing choice... Despite the fact it involves beating the Danes, the Russians and the Reich to the draw. If Poland is to maintain its new status as a genuine power, Wladyslaw must choose his next battle and enemy very carefully.